All standard CrossBreed® products come with a two week trial. If your purchase doesn't work for you, simply let us know. We will be happy to arrange an exchange or to buy your item(s) back, less shipping and handling. Once the two week trial period expires, the sale is final and no returns or exchanges will be accepted. The customer is responsible for return shipping on any items being sent for a refund or exchange. **Refunds or exchanges are not accepted on one-of-a-kind items such as custom holsters or specialty belts. 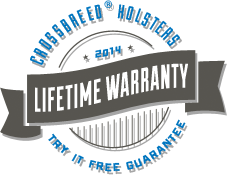 After your two-week-try-it-free period is over, your holster still carries a lifetime warranty and we will repair or replace it as long as you own it if it fails you in any way under normal use. The customer is responsible for return shipping, we will then repair/replace the item and pay to ship it back. There are additional fees that may apply to a return/exchange. If an additional fee applies, please include the payment in the box or indicate on the form how you would like to take care of the fee. This will help us to process your return quickly. CLICK HERE to download the form to request a return, exchange or refund. If you have questions regarding the return/repair or warranty process, please contact us at info@cbholsters.com or call customer service toll free at 888-732-5011.